Tucked away in the mid-Atlantic, you’ll find Cape Verde and its cluster of exotic isles. Each one boasting pristine beaches, shape-shifting deserts and a whole lot of sunshine. But there’s two in particular that we have our eye on – its two main resorts, Sal and Boa Vista. Being the more built-up island of the two, Sal attracts the most tourists. This oasis of deserts and dormant volcanoes offers blissful beaches, world-class water sports, and some excellent fishing spots. By world-class water sports, we mean water sport enthusiasts from all over the world head here during it’s windiest months of January and February, to take on the islands renowned waves. If watersports aren’t your thing, don’t worry there’s plenty of beach to sunbathe on instead. When you’ve had your share of tanning time there’s Santa Maria – the islands busiest town. Here you’ll find craft stalls, traditional restaurants and an 8 kilometer stretch of beach bars to hop between. Top Tip – Keep an eye out for the flag system if you’re planning on swimming in the sea. For those of you who are unsure, red means stay clear, yellow means be careful, and green means you’re good to go. Best for – Those with a taste for adventure whilst still having the opportunity to relax. Where to stay in Sal? With a name that translates into ‘Beautiful View’ – Boa Vista is exactly that. Offering a much more authentic feel than its neighbour island Sal, this is the place to go for the ultimate unwind. Wrapped up in 55 kilometres’ of footprint-free beaches, you’ll feel like you’ve landed on your very own island. Even its capital, Sal Rei is one of the quietest you’ll come across, but that’s certainly not a bad thing. You’ll be able to explore its colonial-style buildings, impressive church and do a spot of souvenir shopping in peace and quiet. 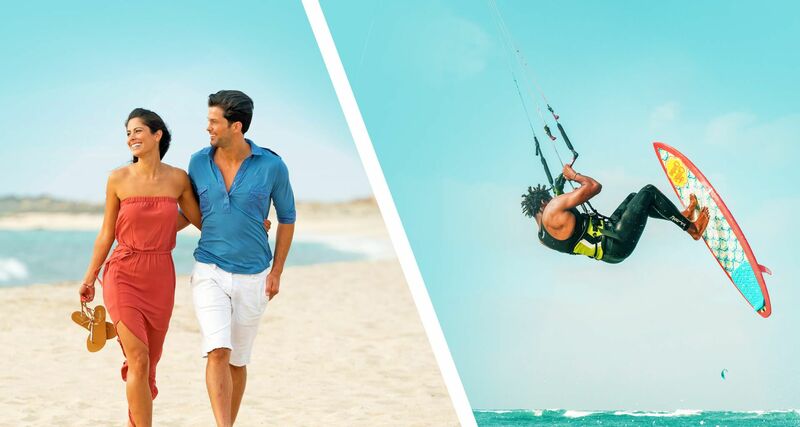 An All Inclusive Boa Vista break is the perfect excuse to explore, so book yours now. Top Tip – Boa Vista is the third most important loggerhead nesting site in the world. So, if you’re a lover of wildlife June and September are the best time to see the baby turtles hatching. Best for – Sunbathing, sipping cocktails and immersing yourself in traditional Cape Verdean culture. Where to stay in Boa Vista? Like the look of Cape Verde? Find out how much you can save with our fantastic Cape Verde holiday deals.